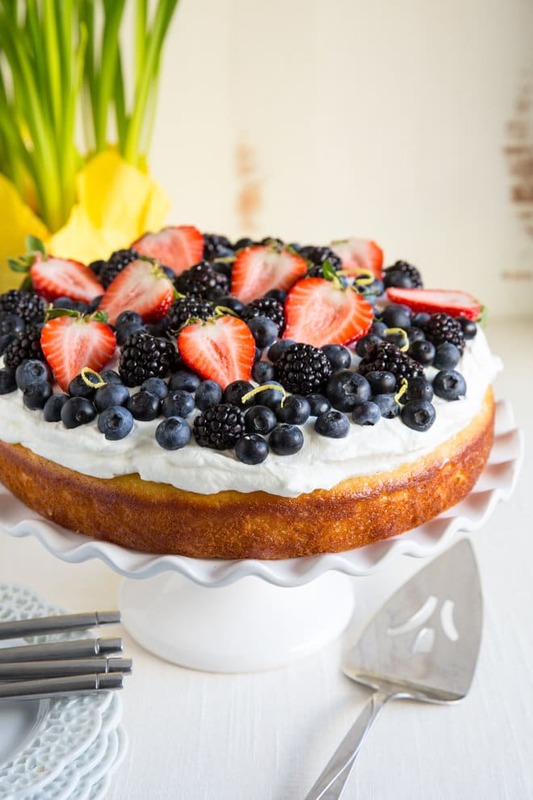 A luscious Lemon Yogurt Cake topped with a sweet lemony glaze, Limoncello whipped cream, and plenty of fresh berries. Perfect for dessert or brunch! I’ve had this Lemon Yogurt Cake recipe on my blog since 2014, but it just got a massive makeover. It’s still moist and delicious with a sweet lemon drizzle, but now it’s done in half the time (thanks to a 10-inch round pan instead of loaf pan) and it has Limoncello whipped cream on top. I’ve made this cake with both Greek yogurt and regular yogurt. It’s delicious both ways! I doubled the zest after a reader commented the cake was not lemony enough. Touché. That’s what makeovers are for. The original version of this cake had two glazes (see recipe notes). I kept the first one, a simple lemony syrup poured over the cake while it’s still warm. In the 10-inch round pan, this works even better. Instead of most of the glaze dripping off the sloped sides of a loaf cake, it stays where it lands and soaks right in. Then things get crazy: Whipped cream flavored with Limoncello. The booze is optional, of course, but it really tastes great. Clarification: It tastes AWESOME on the cake. Eating Limoncello whipped cream straight out of a bowl is a little, well, strong. 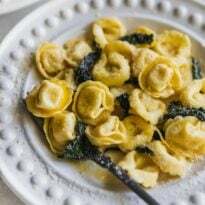 To still have the lemon flavor without the Italian liqueur, fold in 1 tablespoon lemon zest and 1 to 2 tablespoons lemon juice. Here’s a picture of the loaf pan version for your reference. It is denser and takes 1 hour to bake. And it’s so delicious! I also have a Blueberry Lemon Yogurt Cake, also baked in a loaf pan (you can use fresh or frozen blueberries). 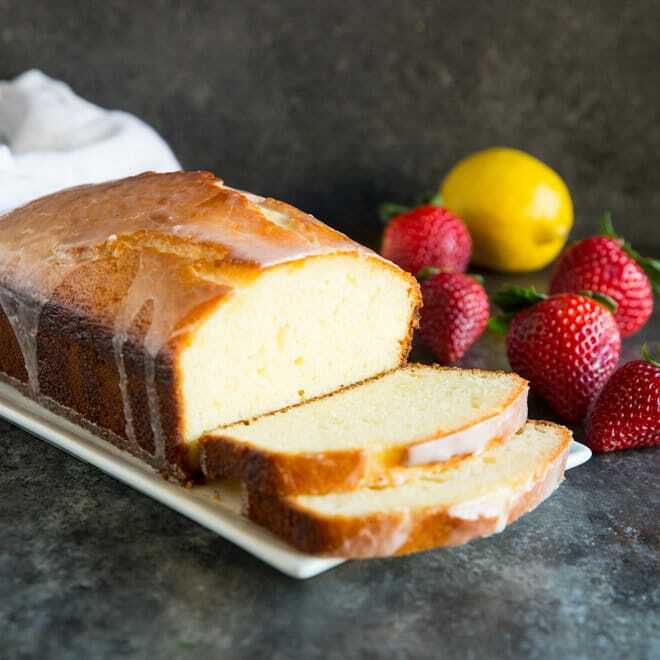 Save this Lemon Yogurt Cake to your “Desserts” Pinterest board! Move an oven rack to the middle position and preheat oven to 350 degrees. 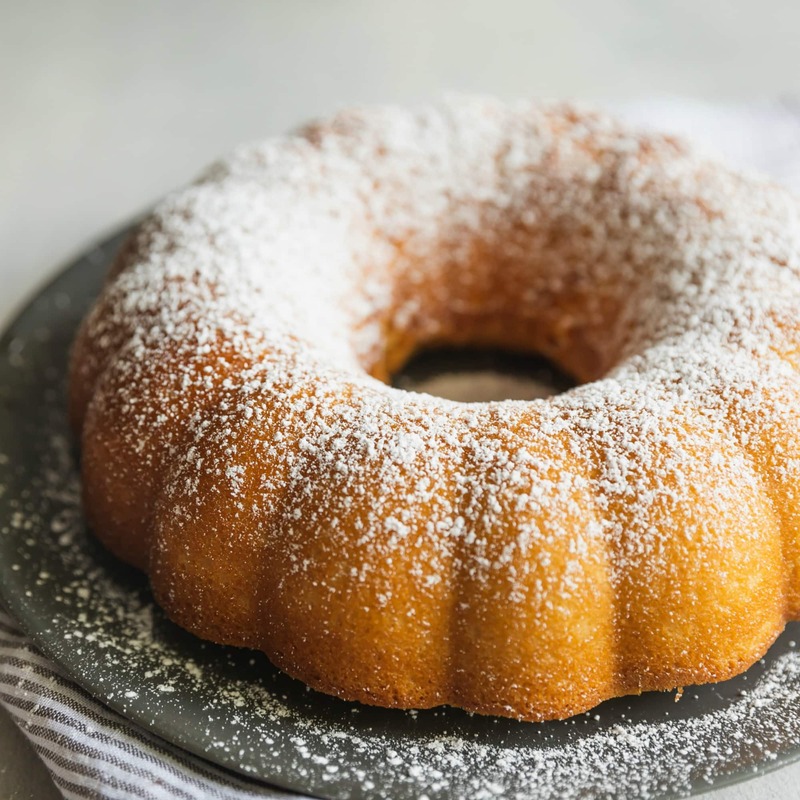 Coat a 10-inch round cake pan with nonstick spray and line with parchment paper. In a large bowl, whisk together 1 cup sugar, yogurt, eggs, lemon zest, and vanilla. Add the dry ingredients in batches, whisking to incorporate after each addition. Fold in oil and stir carefully until uniformly combined. Pour into prepared pan. Bake until a toothpick inserted comes out clean with a few crumbs attached, about 30 minutes. The cake should be fragrant and spring back when pressed lightly. Remove from oven and cool in pan 10 minutes. Meanwhile, in a small saucepan or medium heat, heat lemon juice and 1/3 cup sugar. Whisk until the sugar has dissolved. Remove from heat. Using a sharp knife, slice around the inside of the cake pan to loosen the cake. Flip out on to a large plate. Slowly drizzle glaze over the top. Cool cake completely. To make the Limoncello cream, using an electric mixer with the whisk attachment, whip heavy whipping cream until soft peaks form. Gradually add sugar until stiff peaks form. Fold in Limoncello. 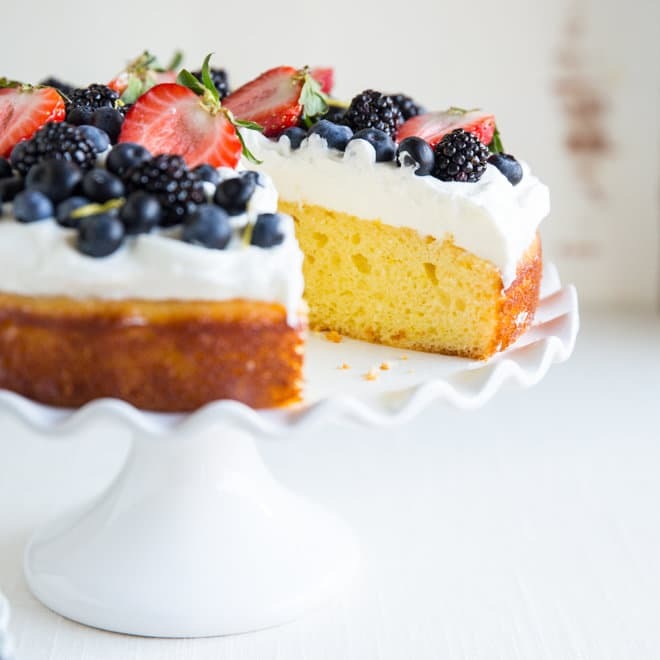 Spread whipped cream on top of cake. 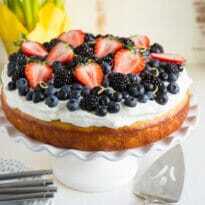 Top with berries and additional lemon zest, if desired. 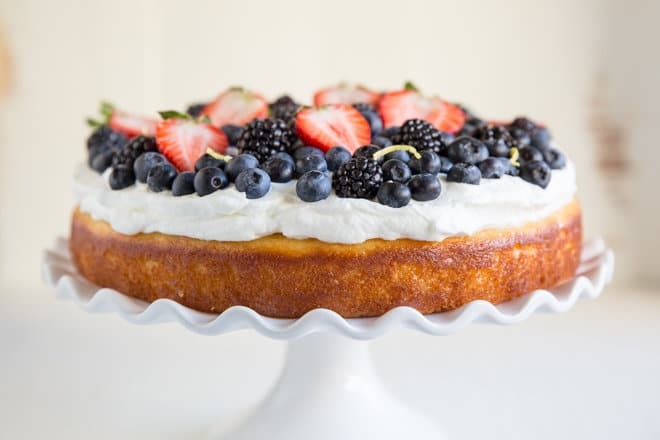 Both the lemon glaze and the Limoncello whipped cream can be made while the cake is baking. Leave the glaze at room temperature. Cover and refrigerate the whipped cream until serving time. 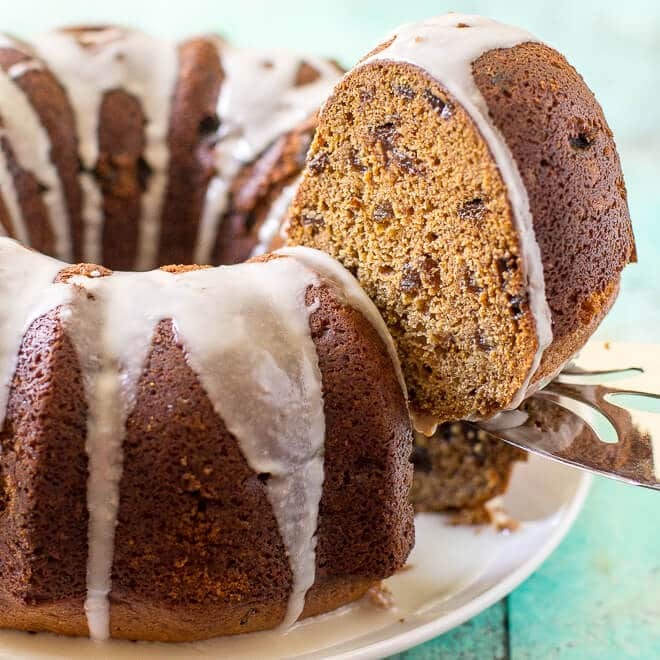 To make this cake in a loaf pan, preheat oven to 350 degrees, coat loaf pan with nonstick spray, and line with parchment paper. Follow the instructions for making the cake. Bake 1 hour or until a toothpick inserted comes out clean with a few crumbs attached. To make a second glaze for the loaf cake (in addition to the one outlined above), whisk 2 tablespoons lemon juice and 1 cup powdered sugar. Drizzle over cooled cake. Adapted from Barefoot Contessa at Home. Limoncello whipped cream inspired by Bon Appetit. 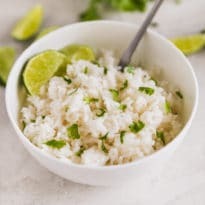 I love how simple yet flavorful this is, wish I had some in front of me right now!! Can you use Greek yogurt? I’d love to try this with lemon Greek yogurt. Yes! I did, actually. I used Fage plain 2% Greek yogurt. I think using Lemon Greek yogurt sounds delicious, great idea! I love combining yogurt and oil in cakes/breads. You can easily cut down on the fat and not really notice a difference in consistency. This one is so good! Yum!! Yes! Lemon loaf cakes are one of my faves. And can we talk about DOUBLE glazes? What a great idea! I am so into that. wow! this looks amazing! can we use coconut oil instead? and about the lemon juice, should it be around quarter cup?? I tried this and your lemon blueberry loaf. I followed the recipe exactly and took them out of the oven after one hour and the straw was clean. unfortunately, I found both cakes lacking in lemon flavour and the blueberry was actually raw in places. I should have followed my gut when I thought it was wrong that they could have the same cooking time. I am going to give this recipe a second try just in case I made an error. If it turns out better the second time – I’ll repost. I’m sorry to here the cakes were lacking in lemon flavor for you. The plain lemon one in particular always makes my face pucker up because it’s so lemony. I feel like that is partly due to the lemon glaze which is 2 tablespoons of straight lemon juice. Did you glaze the plain lemon one? Regarding the blueberry one, I’m sorry to hear it was raw in places. Mine hasn’t been. They have both cooked correctly in one hour. And, that time has worked for me whether I use fresh blueberries or frozen blueberries. Could be a difference in oven temperature. Sorry to hear you were having issues! Hey all you bakers out there here’s what I’ve learned: This may not be a new fact but with some ovens, you may have to turn the item half-way thru baking to ensure even cooking throughout. Get a GOOD oven thermometer and put it inside close to your item to ensure you’re baking at the the correct temperature. If this is an application to be a the Food Editor on my site, consider yourself hired! LOL! But seriously, everything you say is spot-on. As always. Thanks for contributing your genius. 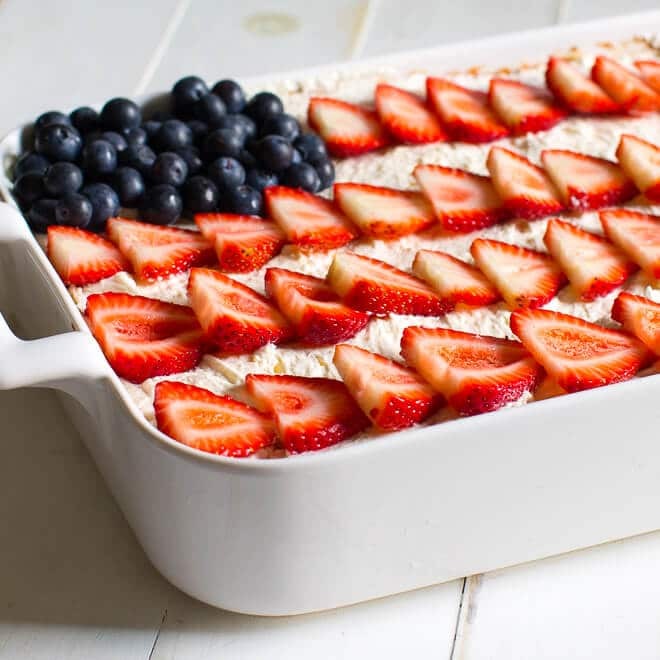 One more suggestion: Get an instant-read thermometer and measure the internal temperature of your baked goods into the center in several places – depending on the moisture of the batter used, toothpicks or straws don’t always work well. Digital thermometers are inexpensive and, for me, indispensable. I use either CIA, Taylor or ThermoWorks products. Since all oven’s are not created equal, check the commonly used temperatures of your oven with a GOOD thermometer. 200° (if you bake cheesecake low and slow like I do) 225°, 250°, 275°, 325°, 350°, 375°, 400°, 425° and 450°. See if your settings are really correct and at least eliminate one variable. Do you think this would keep in the fridge two days without getting smushy if it’s well covered? Hi Judy! I think it would probably be okay. Homemade whipped cream usually lasts 2-3 days in the fridge. What I would do is keep the whipped cream in a separate container (and also keep the berries separate) and assemble it when you need it. So store everything in the fridge separately. That would be your best bet. If you need to assemble it 2 days in advance for some reason, I’d at least keep the berries aside. I hope this helps! Thanks for your question. This looks so bright and fresh! Definitely pinning! Hey There. I found your blog just now. This is a really well presented. I will make sure to bookmark it and come back to read more of your useful information. Thanks for the post.